While this is not an EMD GP7 or GP9, the steam generator location was in the short end of the hood, just as it was in the ALCo RS-3. The blue arrow how the stack was located against the cab wall. About the only thing that would show on the exterior is the exhaust stack for the steam generator, which was an oil fired boiler. There was also an air intake on the top of the hood, centered. A toilet for the engine crew was also located in the short hood section of both makes. The air vent looked like a flattened mushroom, about 18" in diameter. 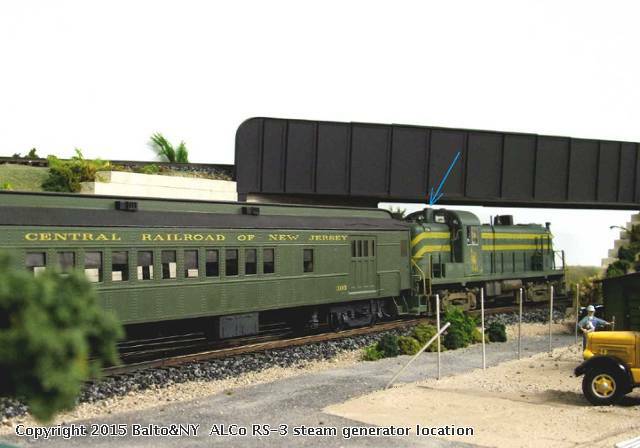 P&D Hobbies has parts to detail the air vent and steam generator for EMD GP models as well as the ALCo RS.